Thanks, Tom. For those who may not know, Tom’s site has become a virtual gathering place for many San Francisco Bay Area hikers and for those interested in all things hiking related. Trees and Grass, Morning. (monochrome) Calero Hills, California. June 23, 2007. © Copyright G Dan Mitchell. 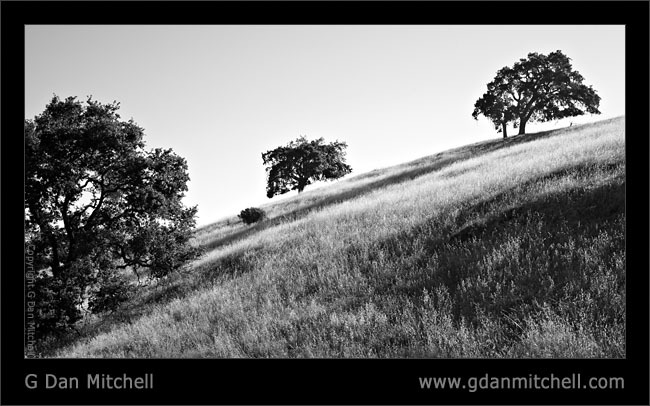 For those looking for the local (SF Bay Area and especially South Bay) photography, let me also point you to G Dan Mitchell | Photography, my main photography web site.